Okay, I’m back in the groove. Or at least I have plans to return to the groove (important if you’re trying to plan ahead and you live in Michigan in January). I have three planned flights so far. This week, it’s instrument currency and initial commercial maneuvers at Flight 101. Flying with an instructor I’ve met once, but with whom I’ve never flown. I think that, once you have your flight skills reasonably down, it’s a good idea to fly with different instructors. You learn more that way. Sure, there are crazies out there and sure, you’re going to discard some of the advice that you receive, but you also pick up stuff that you wouldn’t otherwise get. Next week, it’s up with Barry again in the Citabria. Banking and cranking and starting to build my aerobatic duration for the upcoming season. I want to be able to do an hour straight with tummy in good shape by late May. I got to that point in July, but then work got busy and I had to let the duration slide. I got up in November, but I was done after 20 minutes. Like so many things, you must use it or you’ll lose it. And then the stuff I’m most excited about. 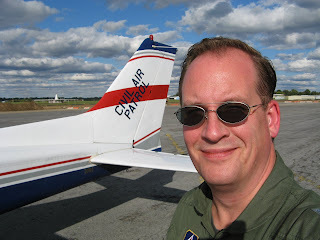 Capt Norm Malek (the ops officer for my CAP squadron and fiercely competent instrument driver) and I are going to go grab 2CP (CAPFLIGHT 2028) in Ann Arbor (KARB) and go get some cross-country time and some instrument approaches and do some hangar flying. I’m thinking KARB-KBTL-KAZO-KARB. But the beauty of it is that we don’t have to go anywhere in particular. Just turning 100LL into noise and challenging each other to improve our skills. If you’re a pilot, why on earth (or off) would you not join CAP? Really excited to be back in the air! Sorry about all of the griping and whining about work over the last few posts, but I’ll try to make up for it with the exuberance that you know I can develop once I get airborne. Yeah! While many of you know about CAP’s flight operations (we handle more than 95% of the USAF-supervised inland search and rescue operations in the United States), we also boast, in addition to the cadet program, the largest aerospace education operations in the country. 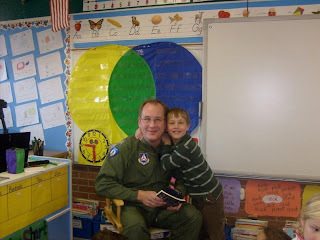 I got a unique opportunity last week to do an aerospace education (“AE”) appearance at Hickory Grove Elementary School where my son is a first-grader in Mr. Gayta’s class. I was a “secret reader,” which means that, at 11:30, I knock on the door, all of the kids assemble on the rug by the reading chair and close their eyes, and I go sit down in the chair for the big reveal. I then read for five or ten minutes from John, the Airport Kid by John Perry Jopling and Hazel Joan Jopling, who we met at Podapalooza 2008 at Oshkosh. To help increase the impact, I went decked out in my CAP flight suit and turned the occasion into a bit of an AE appearance. I got a lot of questions from the kids and there were minor skirmishes over who would get to wear my cover (flight cap). Cole was the proud wearer in this particular shot, although the cover got passed around pretty evenly. I took advantage of the opportunity to tell the kids as much as I could about their local airports and the kinds of aircraft and pilots that one could find there. We also talked about CAP and its missions. I also made sure to hit on the opportunities for women in aviation, which took some of the girls by surprise. The names of Patty Wagstaff, Marsha Ivins, Samantha Weeks, and others therefore crossed my lips more than once. 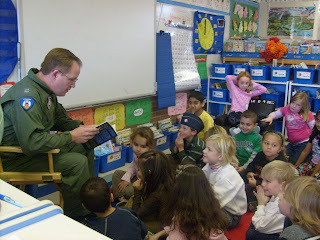 If you’re a pilot, put your time and energy where your mouth is and take the message to the kids whenever you can. Who knows what fires we can light! Subscribe to Airspeed through iTunes or your favorite other podcatcher, listen to audio at http://airspeed.libsyn.com, or download directly at http://media.libsyn.com/media/airspeed/AirspeedMidwaySix.mp3. It’s time once again to talk about the Civil Air Patrol, the auxiliary of the United States Air Force and one of the best volunteer opportunities in the country. As many of you know, I’m a CAP captain and the legal officer of the Oakland Composite Squadron (GLR-MI-238) and I also handle recruiting and public affairs duties. E-mail us at steve@airspeedonline.com or leave voicemail at 206-339-8697 any time – day or night. You can also contact me directly at 248-470-7944.